Led by their young captain Mahipal Lomror, Rajasthan put up an extraordinary show in the league stages of the 2018-19 Ranji Trophy where they stood top of the table in their group. 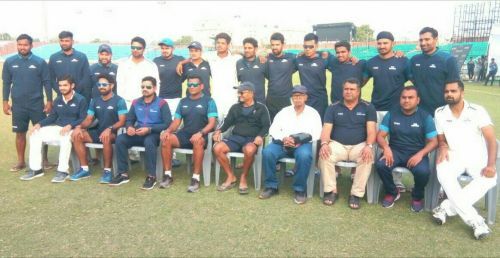 Team Rajasthan was placed in Group C where they finished with 51 points in 9 matches courtesy 7 wins and 2 draws. They started their campaign against Jammu and Kashmir on November 01, 2018 at Sawai Mansingh Stadium, Jaipur. They were thoroughly professional on the field and won the match by 75 runs. Robin Bist and Mahipal Lomror were their two most successful batters, scoring 748 and 708 runs respectively in 16 innings. TM Ul-Haq was Rajasthan's most successful bowler with 51 wickets in 10 matches and Aniket Choudhary was their second most successful bowler with 49 wickets in 9 matches. Rajasthan was going great guns and no team ever looked like giving them a tough fight only till the Quarterfinal match against Manish Pandey's Karnataka. Karnataka won the toss and asked Team Rajasthan to bat first. Rajasthan scored 224 runs with the half-centuries from their Captain Lomror and Rajesh Bishnoi Sr. Abhimanyu Mithun was the most successful bowler for Karnataka in the first innings with 3 wickets. Rajasthan restricted the Karnataka Team to 166-9, but then they let the match slip away from their hands with Vinay Kumar scoring 83 runs in a 97 run partnership for the last wicket. Karnataka finished their first innings with a crucial 39 run lead. In the second innings, Rajasthan went from 118-2 to 222 all out, leaving Karnataka with an easy 183 run target. Robin Bist was the highest scorer for Rajasthan in the second innings with 44 runs. Karnataka chased down the total with 6 wickets in hand. Their captain Manish Pandey scored 87 runs in a 129 run stand with Karun Nair. Nair scored 61 runs off 129 balls with the help of 6 fours. Vinay Kumar was awarded the Man of the Match for his first innings 83 which proved to be the decisive moment in the match. Karnataka will now face Saurashtra in the semifinal which will start on 24th January.